FILE - Martin Ziguele, left, former Central African Republic prime minister, and Nicolas Tiangaye, right, appear at the Bangui airport Jan. 7, 2013. Both are candidates in the next presidential race. In the past few weeks, several Central African Republic political parties have named candidates for presidential elections, while some independent politicians also announced presidential ambitions. With an August target date for elections, the parties are more focused on a political forum within the next few months that’s expected to draw leaders of the country’s warring Muslim and Christian factions. Until then, politicians are not committing themselves to detailed programs – and prospective voters are not committing themselves to candidates. The candidates include party leaders, such as former prime ministers Martin Ziguele and Nicolas Tiangaye, and independents such as businessman Amin Michel and college professor Gaston Mandata Nguerekata. But with armed groups controlling most of the country and ethnic killings continuing in some areas, politicians struggle to be taken seriously. VOA conducted a snap poll here on the streets of the capital, asking nearly a dozen people to say who would get their votes. Few were ready to name a candidate. "It is too soon to talk of elections," said one woman, Clarisse Bemba. "I am a victim of what happened in the Kilometer Five area. I lost my three younger brothers and my property because of the violence in that area." She was referring to killings and banditry in and around a part of the city inhabited by the Muslim community. Since March 2013, when the largely Muslim Seleka rebels seized power in Bangui, violence has ebbed and flowed around its Kilometer Five area. 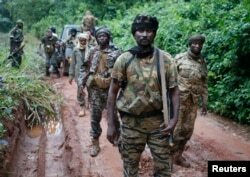 FILE - Seleka fighters search for anti-balaka Christian militia members near town of Lioto, Central African Republic, in June 2014. Many in the C.A.R. 's political class are tainted by association with the Seleka, who still control nearly half the country but are hated by most of the population. Former Prime Minister Nicolas Tiangaye served in the government of former president and Seleka leader Michel Djotodia. Tiangaye now is trying to dissociate himself from the movement while implicating other politicians. On a recent radio program, he said no one had been able to substantiate accusations that he and Ziguele financed the Seleka rebellion or that they recruited combatants for the movement. A recent celebration to mark Tiangaye’s political comeback was marred when four armed men entered his house, firing shots, the guests fled and the refreshments were stolen. Tiangaye said the gatecrashers had been identified, but were unlikely to be prosecuted. "I do not know who I am going to vote for," said Desire Goutia, a cook by trade, "because they are all the same. Their speeches send you to sleep. They pretend they want to help us, but there are no candidates with a real political plan that I can see." Eighteen-year-old Fiston Wayagou said he won’t bother voting "because the person you vote for does not get elected. There is too much corruption." Independent politician Michel Amin is reportedly the one candidate already spending heavily on a presidential campaign. He was asked in an interview whether he had been distributing money for votes. "Well, that is what people say! But you should not base your interpretation on what people say," Amin said, adding his party is engaged in humanitarian action, assisting students and people with health problems. In VOA’s snap poll of 10 people, only one had a preferred candidate: Gaston Mandata, a former minister and mathematics professor living in the United States. Talk of elections is premature until the security has improved, Central African political analyst Didier Kallanda told VOA. He said he’s confident the Bangui forum will be held fairly soon because leaders of the armed groups are losing control and want to leverage political power while they still can.